WASHINGTON — A day after Boeing confirmed delays in test flights of its commercial crew vehicle, NASA said that the company’s crewed test flight will get an extended stay at the station when it does fly. In an April 3 statement, NASA said that the Crew Flight Test of Boeing’s CST-100 Starliner, expected no sooner than late this year, will be a long-duration flight that could potentially stay at the station for months. The exact duration of the mission will be determined “at a later date,” the agency said. NASA announced a year ago that it was working with Boeing to examine the feasibility of an extended Starliner test flight at the station. That extended mission would effectively turn the test flight into a crew rotation mission as NASA’s access to Soyuz seats runs out. The two NASA astronauts scheduled to fly on the Crew Flight Test, Nicole Mann and Mike Fincke, have been training on ISS systems in preparation for a potential extended stay at the station. They’ve been joined by the third crewmember for that mission, Boeing test pilot and former NASA astronaut Chris Ferguson. Russian media has also reported that NASA has approached Roscosmos about adjusting the schedule and crews of upcoming Soyuz missions to the station, including the possibility of having one or more astronauts stay on the station for longer than the standard six-month crew rotation. NASA has not confirmed any changes to those plans. The NASA statement came a day after Boeing said it was delaying the first, uncrewed Starliner test flight, known as the Orbital Flight Test, from this spring to August. NASA said that “limited launch opportunities in April and May” for the mission on an Atlas 5, and a national security payload scheduled to launch from the same pad in June, prompted the delay. The most recent official update of commercial crew test flight schedules, released by NASA Feb. 6, stated that the Orbital Flight Test was scheduled for no earlier than April. An April launch, though, was unlikely regardless of the readiness of the spacecraft and launch pad because of heavy traffic at the station in the form of Progress, Cygnus and Dragon cargo missions. While the Starliner that will fly on the Orbital Flight Test is “nearly complete,” according to the agency statement, Boeing will use the additional time to conduct additional testing of the spacecraft. “While we have already made substantial progress this year, this shift gives us the time to continue building a safe, quality spacecraft capable of carrying crews over and over again after a successful uncrewed test, without adding unnecessary schedule pressure,” John Mulholland, vice president and program manager for Boeing’s commercial crew program, said in the statement. 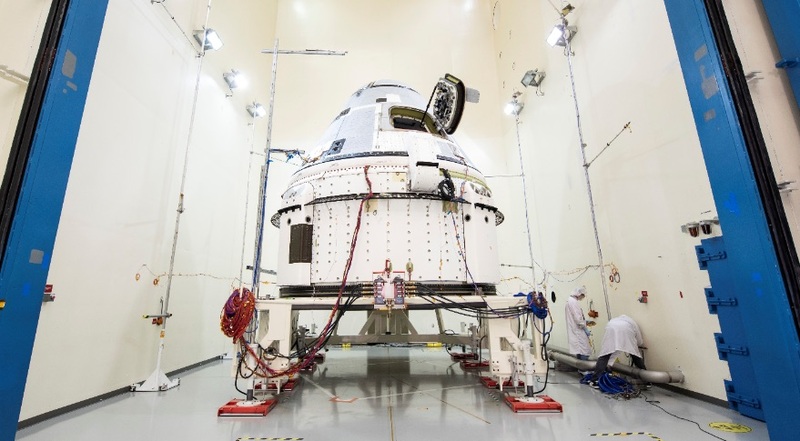 There are no plans to extend SpaceX’s crewed test flight of its Crew Dragon spacecraft, known as Demo-2, when it flies later this year. NASA astronauts Bob Behnken and Doug Hurley are expected to spend no more than a couple weeks on the station on that test before returning to Earth.